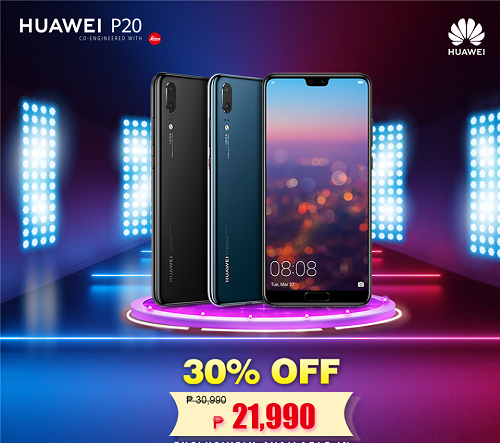 Huawei P20 at 30% Off at Lazada! Here’s an opportunity you may not want to miss! From January 14 to 16, the Huawei P20 will get a whopping 30% discount when purchased at the Huawei Lazada Flagship Store. The Huawei P20 series became popular thanks to its flagship, the Huawei P20 Pro which is known for taking excellent pictures with its triple-cameras. Despite being the lesser known phone in the series, the Huawei P20 is still one of the best phones to have in P30,000 price range. With a discounted price of P21,990, the P20 is a very good bargain! The P20 is equipped with a 5.8″ Full HD display, a fast Huawei Kirin 970 Octa-Core processor, 128GB of internal storage and 4GB of RAM. It doesn’t have a triple-camera system like the more popular P20 Pro, but its dual cameras composed of 20 Megapixels and 12 Megapixels with Leica optics are sufficient enough. Powering the P20 is Android 8.1 Oreo and its battery capacity of 3,400 mAh should last you at least for one full day.